There’s not much to say about this one. This entry was posted on Thursday, July 31st, 2008 at 3:09 am and is filed under art, fashion, food & drink. You can follow any responses to this entry through the RSS 2.0 feed. You can leave a response, or trackback from your own site. It’s hilarious! 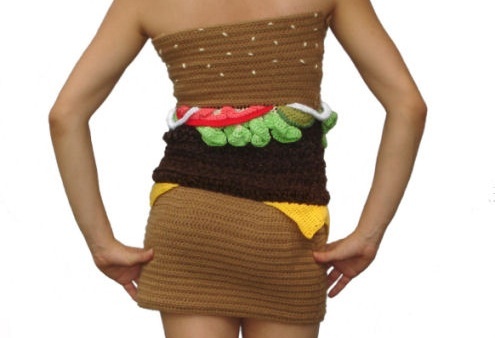 Who came up with this idea: knitting a buregr dress?! Too funny…I wouldn’t wear it though..
correct. Oh fashion, I bow to you. haha.